Thanks to our expertise in targeted protein degradation we take multi-faceted approach to eliminate pathological proteins. Our technology consists of bifunctional molecules, direct degraders and molecular glues. Our proprietary Obteron™ platform enables robust discovery of therapeutic compounds with good biopharmaceutical properties. These compounds lead to efficient protein degradation via proteasome and/or autophagosome. Supported by over 20 mln EUR from European grants and private investors, we are currently working on three priority projects aiming at: (1) advancement of a protein degradation platform and (2) development of first-in-class therapeutics for autoimmune and oncological indications. At Captor Therapeutics we cover all aspects of early-stage drug development to deliver therapeutics for life-threatening and life-impairing diseases. Our integrated approach combines in-house organic and medicinal chemistry with molecular modelling, high-throughput phenotypic screenings, biophysics and in vitro degradation assays. To unlock the potential of UPS (Ubiquitin Proteasome System) Captor Therapeutics is developing a large platform of ubiquitin ligases with their ligands. This approach will enable us to adapt the degradation process to therapeutic indication. Our main goal is silencing of disfunctional proteins on the post-translational level. To this end we are using a broad spectrum of chemical biology methods. Currently, we are developing first-in-class molecules to treat various pathological conditions, e.g. cancer and autoimmune diseases. Today, biologics (antibodies or their fragments) represent the main therapeutic modality for the treatment of many of the autoimmune and inflammatory conditions. Many of these biologics control the pathogenic process by interjecting with either surface receptor proteins or their extracellular ligands. The main disadvantage of this approach is that pathogenic proteins often play roles in more than one downstream signaling processes. Inhibition of these receptors by antibodies dysregulates pathogenic but also beneficial molecular pathways, which ultimately leads to severe side effects of targeted therapies. In Captor Therapeutics, through our proprietary protein degradation platform, we selectively target only downstream pathogenic signaling activated by the aforementioned receptors, while preserving the beneficial pathways. This approach is used to intervene in autoimmune, inflammatory and neurodegenerative diseases. Spontaneous mutations often abrogate interactions between E3 ubiquitin ligases and their partner proteins. This may result in accumulation of the latter, leading to dysregulation of molecular signalling and ultimately to tumorigenesis. Captor Therapeutics has developed a molecular repair platform that is capable of reconstituting interactions between ubiquitin ligases and their molecular partners, which restores cellular homeostasis and prevents cancer progression. 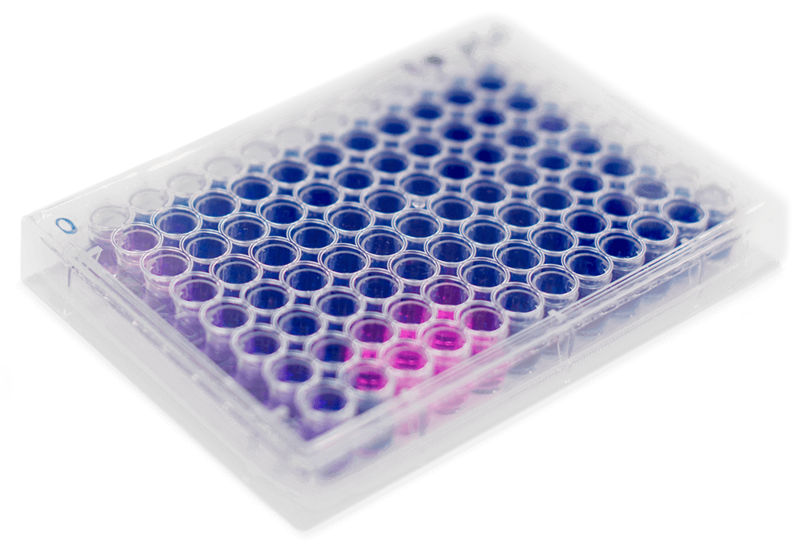 Goal and expected results of the project: development of scalable and sensitive high-throughput fluorescence assay allowing for rapid detection of active PROTAC compounds which induce degradation of pathological proteins. Goal and expected results: development of two-stage high-throughput screening assay for low molecular weight compounds which induce targeted protein degradation. Goal and expected results: Development low molecular weight compunds inhibiting receptor proteins by applying the bispecific inductor degradation (BID) technology which will be drug candidates for patients ailed with rheumathoid arthritis or inflammatory bowel disease. Goal and expected results of the project: Development and testing in the first stage of clinical tests of low molecular weight chemical compounds which will be future drug candidates in tumor therapies of non-small lung cancer and triple negative breast cancer. Degradation of proteins is a relatively new approach in drug development. We are developing low molecular weight compounds capable of inducing degradation of targeted proteins in vivo. These compounds can be further developed into new therapeutics with limited side effects and convenient routes of administration. One of the most substantial features of our drug candidates is the fact that their efficiency is not dependent on the enzymatic or binding function of the protein of interest, therefore we are also able to target the so-called “undruggable” proteome. Captor Therapeutics' drug discovery platform is based on an array of chemical biology tools that hijacks intracellular protein degradation machinery. Our expertise covers also allosteric modulation of proteins (allostery platform), fragment-based drug discovery (FBDD), structure-based drug design (SBDD) and phenotypic screenings. 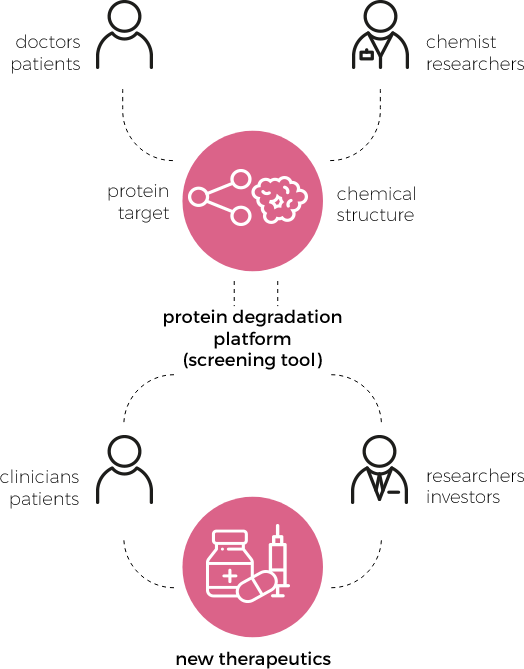 The company’s mode of action is presented on the scheme – we communicate with doctors and patients to identify areas which suffer from an urging need for novel therapeutics (for example due to substantial side effects of known drugs, their limited effectiveness, or no drugs being available at all). Then, using our proprietary screening platform and a tailored library of chemical structures developed by our chemists and biochemists we identify possible drug candidates towards selected disease-related molecular targets (proteins of interest). After collecting the initial research data and confirming the desired activity of the future drug we move first to pre-clinical, and then to clinical trials. At this point a close partnership between researchers, clinicians and patients is required to gather large amounts of significant and conclusive data which enable us to bring the new therapeutic to the market.